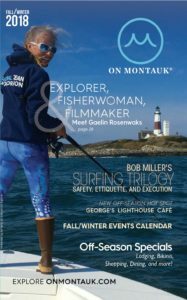 Ocean Rescuer, lifeguard and surfer Bob Miller has imparted his water and surfing wisdom with On Montauk all through 2018. The natural beauty of some of the End’s most unique spots will give your body and brain a serious reboot. Kate Mueth’s Neo-Political Cowgirls and other inspired programs are injecting east end kids with theatre, and confidence. Kate Usher and The Sturdy Souls, Young Guns of the Montauk Music Scene, are a new breed of performer defining a generation at the End. When Nancy Atlas is not performing on stages throughout the Hamptons, this rockin,’ guitar-playing singer and songwriter seeks refuge in the natural wonders of the East End.